While watching "The Help," there was never a moment where I felt a secure, deeply felt story was being told. Instead, the film is a highlight reel of exaggerated emotions and social concern, struggling to find its voice while incomplete scripting and overly emphatic performances keep the feature's bloated intentions blurred. Spending more time tugging on heartstrings than exhaustively studying the characters, "The Help" can't avoid feeling wholly insincere. In Jackson, Mississippi during the Jim Crow South era, the divide between the black "help" and the white elite is growing wider, a fact that frustrates budding journalist Eugenia "Skeeter" Phelan (Emma Stone). Coming up with an idea to interview local black maids and compile their stories of woe and rage into a book, Skeeter sets her sights on Aibileen Clark (Viola Davis) and Minny Jackson (Octavia Spencer), two housekeepers who've spent their lives serving the demands of white people, even raising their children. At first fearful to share their deepest thoughts, the maids soon agree to the interviews, unleashing shocking stories of mistreatment to a stunned Skeeter. Also in the mix is Hilly Holbrook (Bryce Dallas Howard), an arrogant community leader who has trouble concealing her bigotry, and Celia Foote (Jessica Chastain, pleasingly daffy), a ditzy social outcast who leans on Minny for support. Adapted from the popular novel by Kathryn Stockett, "The Help" was written and directed by Tate Taylor, a filmmaker with only a single feature credit to his name. With something as sizeable and delicate as this story, it fails to make much sense why Taylor was entrusted with so much. The world of "The Help" is in dire need of a veteran helmer who can offer a spectacular command of internalized emotion, someone capable of turning this often Hanna-Barbera world of cherry-lipped southern caricatures into a tapestry of turmoil and shame. Taylor creates a handsome picture crawling with colorful period details and a palpable sensation of summer heat, but he doesn't possess the moviemaking experience to combine various characters and tangents into a cohesive, inspiring whole. "The Help" skips all over the place, often pushing aside the concerns of the titular group to keep up with the younger leads. Admittedly, there's a sizable amount of plot to wade through, and the task of organization quickly overwhelms Taylor, who jumps from subplot to subplot without smooth transitions, creating an episodic feel that lances the thematic boil of the material. Rarely is there a feel for a community engaged in a private war. Only fragments of agitation remain, finding Skeeter struggling with her love life (a subplot that goes nowhere) and launching uncomfortable questions about a beloved maid (Cicely Tyson, who overacts like a maniac) who was hurriedly dismissed, while Aibileen and Minny deal with their own domestic trials, often instigated by Hilly and her unfettered hate for African-Americans. Attempting to wrap his arms around the entire story, Taylor exhausts focus quickly. 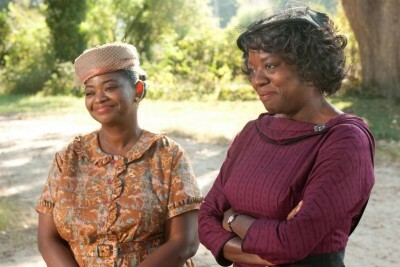 "The Help" ends up disconnected, often flopping around to make a quick impression instead of rethinking and linking these women in a more fluid, organic manner. Saving the film in small increments is powerful work from Davis and Spencer, who generate real flesh and blood characterizations while battling pages of hokey dialogue and unfortunate racial-barrier simplicity. Spencer is a firecracker as Milly, enjoying the flashier role of a frustrated maid who employs her own special brand of tainted baking to seek revenge on her former employers (perhaps the Farrelly Brothers did an uncredited rewrite?). She's delightfully energetic and a fine counterpart to Viola's concentration, which is a thing of beauty to behold, especially when Taylor backs away and allows the gifted actress room to work. Her scenes of confession are the best in the movie. Shattering the fragility of the picture is Howard, clomping around the movie as though she's starring in a one-woman show. Pitching her southern hostility to the rafters, the actress wildly overplays Hilly, making a monster out a woman who clearly has personal issues the film doesn't even pretend to care about. She's the racist Disney Villain of the piece, with extravagant hair and costumes to sell the deafening wickedness. The audience is forced at gunpoint to hate this embodiment of white privilege, to relish her grotesque comeuppance after years of framing maids for theft and making the help do their bathroom business in the backyard. The one-dimensionality of the role is unintentionally hilarious -- Hilly's a scaly beast, not an educational representation of a specific cultural mindset. There's nothing nuanced about the performance. She's just someone to hurl tomatoes at. Taylor pours the intolerable schmaltz on thick in the absurd last act, reminding his audience that racism is indeed bad (gee, I wasn't aware of that) and black people are generally helpless unless they somehow acquire white representation. The lack of sophistication is alarming, downright depressing at times, especially with such a profound historical foundation to build from. In the end, it's not a particularly original story and not sold with much integrity. A few wonderful performances aside, "The Help" is a maddeningly distracted film, occasionally flirting with utter irresponsibility. Buy tickets to "The Help" now!